9 slots available on the inside to hold cards, I.D., money and a passports. (5 card slots, 3 money receipt slots, 1 passport slot) Casual style with efficiency and convenience. Folding design with magnetic flap. PU Leather eliminate bulky and heavy wallets with this slim and lightweight case. Measures 5.62" x 8" x .125" (142.74mm x 203.20mm x 3.18mm) unfolded. 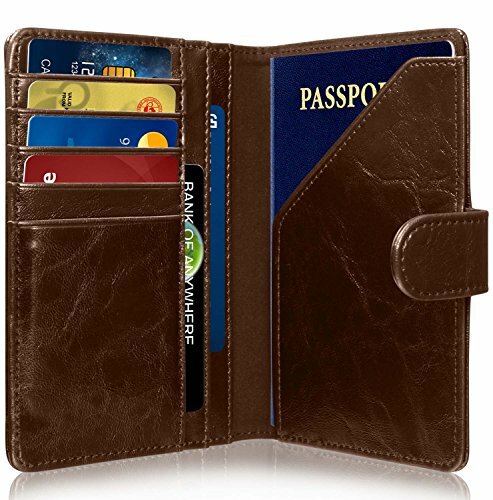 [STYLISH DESIGN] GreatShield RFID blocking wallet is made with brown PU leather. [CAPACITY & STORAGE] 9 pocket slots with money slots available all includes with 5 card slots, 3 money receipt slots, 1 passport slot. [PORTABLE & TRAVEL] Slim size with no bulkiness, can easily carry around in purse, pocket, carry on bag, back pack, or by hand. [RFID PROTECTION] Equipped with RFID blocking material to help prevent identity theft. [FEATURES] Foldable flip cover with magnetic strap to keep wallet closed. If you have any questions about this product by GreatShield, contact us by completing and submitting the form below. If you are looking for a specif part number, please include it with your message.